The 3-15 T5Xi model has a more compact design and allows for parallax focus down to 25 yards. T5Xi 3-15x50 is rated 4.8 out of 5 by 205. Rated 5 out of 5 by Tactical204 from This product has great features I bought this scope for precision shooting. I have many other "top name" scopes and I think that Steiner has hit a home run with this one. The clarity and crispness of the glass edge to edge (strictly subjective I know but like I stated I have some very expensive glass for comparison) , the low profile turrets, auditable clicks (firm but smooth) elevation window and generous eye box sets this line of scopes in a direction that will soon become very popular as I know the precision shooting bunch has been waiting for something like this for a while and with the price of glass these days well... it's about time Thanks Steiner now we need it in a good MOA reticle as well! Rated 5 out of 5 by gearjunkie from You get what you pay for I was looking for a quality FFP scope but I didn't like the idea of spending a lot of cash on a scope and then having a hard time seeing the reticle at low magnifications. The illumination on this model takes care of that issue and I am thrilled with the purchase. The scope is built like a tank and the turrets are excellent. Clicks are positive, turrets are low profile but easy to use, and the adjusting numbers on the turrets are great- so much for having to keep track of large adjustments. The clarity is excellent throughout the entire magnification range and I think I've finally found a scope that will stay on my rifle for a lifetime. 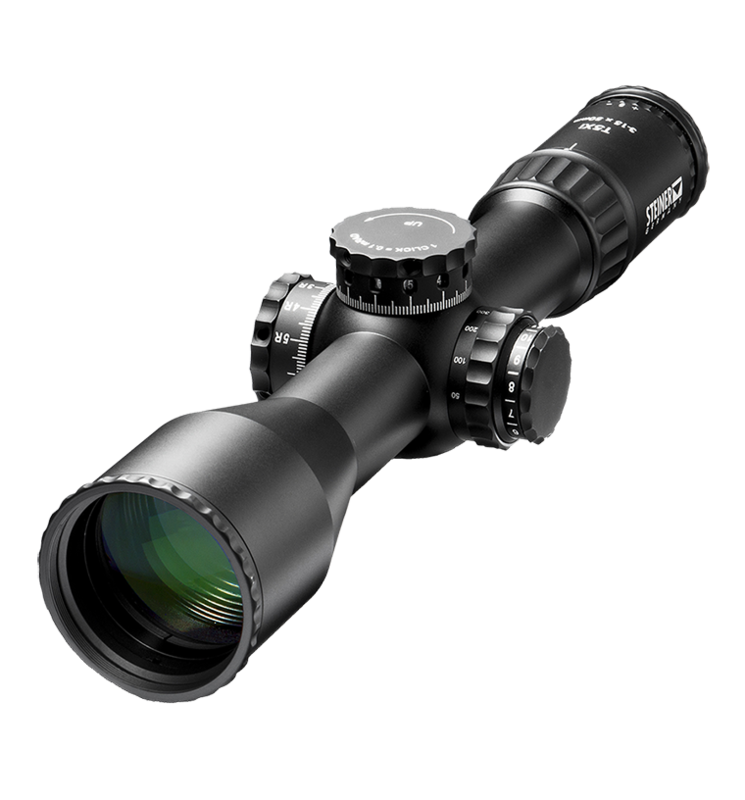 Rated 5 out of 5 by per19 from Great for both range and hunting A friend recommended this scope to me; I needed something which would provide a seamless transition from the range (target 200-400y) to hunting in the field (close up out to about 400y primarily in clear-cuts). I have now tried both and the 3-15 with the precise turret dials combined with the parallax adjustment and the 34mm lens which allows plenty of light through is just about perfect for that. The light weight construction is also a plus when it goes on a rifle you carry in the field. At dusk and early morning the illumination worked great - I dropped a coyote at almost dark at 240y. Rated 4 out of 5 by Justincase from Great scope Perfect for my needs This scope is going on my 338 lapua long range hunting rifle. So i needed great glass but didn't want it to weigh a ton and I also wanted no more then 4 power on the bottom end on the mag power. So this scope fit the bill perfectly. The retictle looks easy to use and turrets are awesome. The only reason I gave it 4 instead of 5 stars is because it has 34 mil's of adjustment but the never lost turret only lets you use 23.4 mils of it once zero'd. With the rifle 23 mil's will be more than enough to reach way out there, but still would have been nice to been able to use all of the adjustment. Rated 5 out of 5 by Kiba from Great overall package and features Ordered a pair of the 3-15s for two of my lighter rifles. I was looking for a somewhat compact scope 30oz or under, FFP/mil/mil, illuminated reticle, 22 mils minimum elevation travel with zero stop, and a reticle with fine windage graduations similar to the H2CMR reticle in my S&Bs. Since one of the 3-15s is going on a rimfire 25Y parallax was a must. The T5XI 3-15 met all my requirements; relatively compact overall package, the SCR reticle offers fine windage graduations, great feeling turrets with plenty of travel and zero stop and a clever second revolution indicator, 25Y min parallax at 15X magnification, glass clarity is quite good, very friendly eyebox at 15X, and great illumination of the entire center section of the reticle. The locking diopter is a nice feature as well. Very pleased with the overall package! Rated 5 out of 5 by DonP from Steiner Optics !!!! I absolutely Love my 3-15 T5Xi ! Im still waiting on my POF to arrive, but couldn't wait so I put it on a PWS .223. Supper accurate gun and Now its like I'm cheating. This is by far my favorite scope to shoot with right now. The SCR reticle is GREAT for long range shooting. Definitely a wonderful add ... Thank You Steiner, Donny P.
Rated 5 out of 5 by Cobra202 from Exceptional glass for a good price. Bought the T5xi for my DRD Paratus but couldn't fit it in the break-down carrying case. No biggie, just switched it with my Trijicon Acog from my Scar17s. The beauty of the T5xi is that it's rugged, fairly compact and of course has great glass. So it's a natural mid-range scope for my Scar 17s. Rated 5 out of 5 by Rob_RCAF_JTAC from Great mulit-use scope I bought this mainly for long range shooting with a Rem 700 300WM for target shooting between 600-1500 meters. If you plan on doing extreme long range shooting go for the 5X25 X56mm for the extra elevation adjustments and use a 45 MOA rail. I am using a 20MOA rail which is fine for what I am using it for. It's also a good scope for my AR15 that is use between 200-300 meters (too heavy for CQB IMO). You can't have a scope that does every style of shooting; I think this is a good option if you only have enough money to buy one high-end scope but wish to shoot different styles. I have an Springfield M1A Scout Rifle which I have mounted a Sadlak Airborne Scope Mount. Would the Steiner T5Xi 3-15x50 be a suitable optic for shooting targets &lt;700 yards and if so which rings would I need? I was originally interest in the 3X-12X-56mm G2 Mil-Dot but is the 50mm sufficient for a Steyr 30 for shots out to 1,000yds. The 3-12 is more than sufficient to reach out to 1000 yards. We recommend 1 magnification power per 100 yards you want to shoot. I am considering the T5Xi 3-15x50 in combination with the Brobo SCAR 34MM mount for use on a FN SCAR17. The SCAR has a unique recoil impulse that is known to be devastating to lesser optics. Will Steiner stand behind the use of this combo? I recently saw this scope at a store and am considering using it for my Remington 700 in .308. What MOA pic base is best to use to get a 100 yd zero and also be able to reach out pass 500 yds? Doesn't seem to be much internal adjustment. It is recommended to use a 45MOA rail to get the full range of adjustment for this scope. The T5Xi comes with a sun shade. I am going to build a custom .308 and I'm thinking of using your T5Xi 3-15x50 and I'm curious what the weight is. What height size mount should I use with a POF P308? I am wanting to use a 20moa mount. If your rail does not extend to the end of the handguard, You may be fine with High rings, otherwise, X-high. Does the 3-15 model number 5114 have the adjustments on the dials in MOA? The photo on the website for this model shows the dials in Mils. I&rsquo;m using this scope on a Smith&amp;Wesson Performance Center M&amp;P 10 6.5creedmoor. What rings should be used? Hello! The 5114 is the MOA version. For your rifle I would recommend the T-Series mount or extra high T-Series rings.